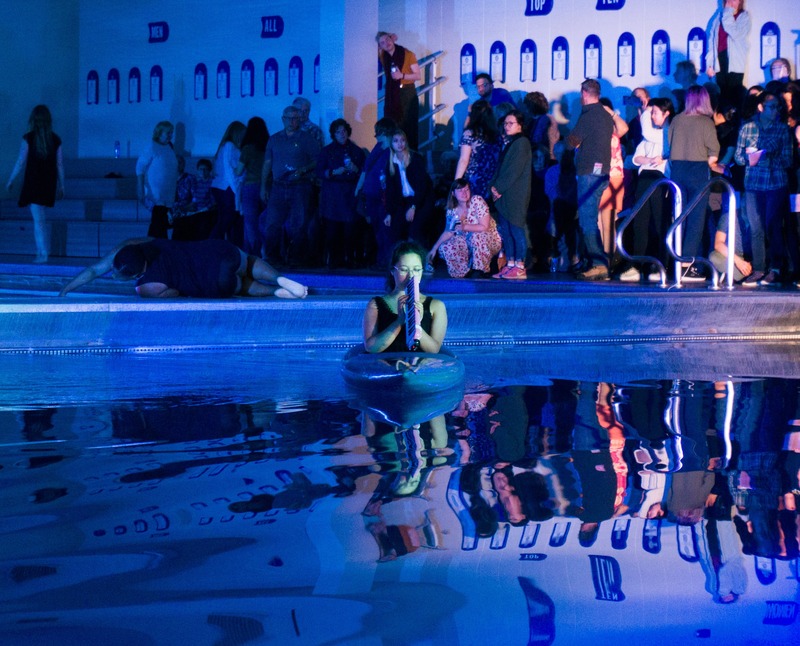 “Someone plays cello underwater?” “A diver?” “Melodica in a kayak?” “How is this possible?” I fielded many of these incredulous questions as I tried to explain “Breathe” to my shocked friends and family who couldn’t believe such a production was possible. To be honest, I could barely believe it myself. I first heard of “Breathe” about a year ago while sitting in songwriting class with Lecturer of Music Loren Dempster who casually mentioned that playing cello underwater was something he did. Later that fall, Dempster ended up coaching my free improvisation trio, Visible. We all enjoyed working together, and “yes” was the resounding answer when he asked us if we were interested in playing on “Breathe” in the spring. During the very first rehearsal, I was a total mess of nerves. I sat there in the corner with my pink melodica, bought for $30 on Amazon one year prior, with a sinking feeling that I had gotten myself in over my head. The piece’s rhythmic meters were changing too quickly for me to catch on. My melodica was acting up. My solos were nervous and riddled with clunkers. Impossibility loomed scarily. Rehearsals were long. There were just so many logistics, so many questions, so many decisions that depended on other decisions that depended on other decisions. Yet at the same time, there was an excited and determined energy. Little moments of triumph—like finally nailing the ever-changing rhythmic meters or how I was going to get in and out of the pool from a kayak—felt like tremendous achievements. We were inching our way to possible. It was going to happen. That final tech week when the show finally came together was the closest thing I’ve ever felt to magic. Logistically, everything felt solid. I’d figured out how to finally tame my unruly toy melodica. We knew where to step and when to play and what was happening. We had the lights, we had the text and the energy was electric. I remember walking home crying after one of the rehearsals because I realized I had been so wrapped up in my own part that I hadn’t realized just how incredibly beautiful and meaningful the show was. “Breathe” is so much more than a spectacle of incredulous impossibilities. It’s a meditation on space, childhood and what happens when you grow up and begin to organize the world. It’s like being inside a consciousness wondering, playing and dancing between all boundaries of space, time, being and community. It’s a testament to the unmeasurable powers of creativity. It’s a reminder that it is okay to not know and that not knowing can be a space of opportunity, wonder and play. During the very last show, I felt this incredible sense of oneness with the space. All boundaries felt obliterated. The audience walked in tandem with performers around the pool. Two musicians played conch shells in the pool. I was spun around in a kayak by dancer and choreographer Gabriel Forestieri while I played the melodica. A swimmer swam laps. The lights created another world. I’ll never forget that energy. We were so many moving parts of a whole, but each person had a moment. It was a space of validation and affirmation. You are seen. You are heard. You belong. You are a part of something bigger than yourself. It brought so many people together. It was playful. It was healing. For me, it was such a reminder: this is what art has the power to create.